Southwark Stars Awards recognise the invaluable contribution which volunteers across Southwark make to their communities. The awards were given to individuals who completed over 100 hours of volunteering to support Southwark communities in the last 12 months. The two students from LSBU who have won the prestigious award are 41 year old Accounting and Finance student Mark Mccauley Gbaewoh Conteh, and 35 year old Electrical and Electronic Engineering student Troy Sheppard. While studying at LSBU, Mark has been volunteering as a Finance Manager for 3rdthought Arts Collective. The 3rdthought Arts Collective is a project led by the 1st Framework Charity, which delivers intergenerational arts education collaborative projects, particularly focused on engaging older people in activities in their local communities. The Community Life Survey found that the proportions of individuals volunteering in the UK has decreased from last year's survey, making it even more important for individuals to get involved in local volunteering activities. Mark said: "As well as helping others, I see volunteering as a way of gaining the experience and knowledge employers are looking for, whilst also being an opportunity to develop his skills and to work with people from a wide range of backgrounds." With a love for music and using this as a tool for creating communities, Troy brought this enthusiasm to LSBU and established the DJ Society. Troy created this extremely popular group for people with similar interests in music to socialise, hold events and lead workshops enabling students to learn and develop DJing skills. Troy said: "This opportunity has given me the chance to improve my communication, networking and organisation skills whilst helping people and making new friends all at the same time." In June 2014 LSBU celebrated the success of the first year of its student volunteering programme. 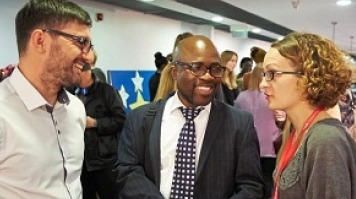 More than 600 LSBU students have signed up to volunteer since the programme started, with well over 150 organisations partnering with the university.